Acquia Review 2019: Is Acquia a Good Hosting? Acquia is a developer-friendly cloud hosting platform specially optimized for Drupal. Their solutions include secure and scalable cloud hosting for Drupal websites, personalization and customer journey orchestration, multi-site management, and digital asset management. onClick="trackClickout('event', 'clickout', 'Vendor Page - Visit User Reviews', 'Acquia', this, true);"
Acquia sells a commodity, not a custom solution. So the idea that they have to understand your requirements before they give you a quote is simply so that they can figure out how much they can charge you. That is 100% price gouging. They need to be more transparent and publish their enterprise subscription prices which are often TEN TIMES the regular prices. I simply cannot justify to my customers why they should have to pay the salary of a systems engineer on an annual basis. And they may charge one customer 4X what they charge another customer for the exact same thing. They would be great if not for their sales tactics. This seems to have become a lot worse over the last year, which spells trouble for the company. I am not recommending them anymore. Acquia is a developer-friendly cloud hosting platform specially optimized for Drupal. Their solutions include secure and scalable cloud hosting for Drupal websites, personalization and customer journey orchestration, multi-site management, digital asset management, and much more. They’ve served over 3000 customers and currently host over 11700 websites. Though headquartered in Boston, they have offices around the world. Acquia’s specialty is centered on the fact that they leverage the open-source Drupal content management framework. What makes them particularly appealing to their customer base is that, unlike many of their competitors, customers can purchase resources and features individually rather than purchasing entire pre-made packages. This way, you can avoid paying for features that you’re not going to use. 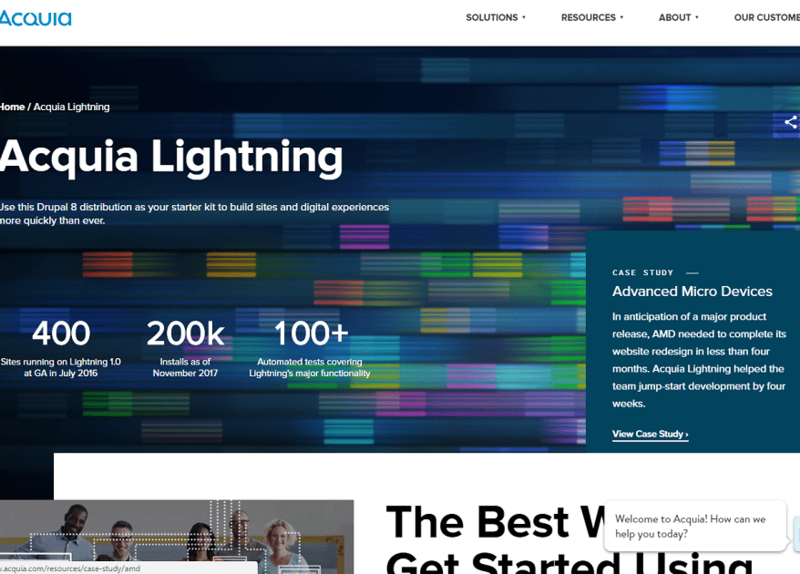 Amongst Acquia’s tailored solutions is Acquia Lightning — a starter kit designed to streamline the development process of Drupal 8 projects. Using the kit’s module selection and configuration process, along with tools focused on media usage, layout, workflow, and previews, developers and marketers can quickly and easily design a website for stellar user experiences. Using the starter kit, one AMD product delivery team even cut four weeks from their projected four-month development timeframe. Acquia also has packages for e-commerce website owners, providing a PCI DSS compliant solution that can easily scale to accommodate large transaction volumes, any surges in traffic, and extensive product catalogs. You can also use their proprietary e-commerce manager to integrate the various content, commerce, and user interfaces, allowing you to provide seamless experiences to your customers via a single system rather than patching together many different software. Because Acquia’s solutions are so specific, they tend to appeal more to enterprise-grade clients and government entities rather than to individuals or small business owners looking to set up a basic website. Their prices can also be on the high end, given the quality and the considerable number of value-added features they offer. They cater their pricing to each customer individually, so you’ll have to contact them to ask for more detailed quotations. Acquia offers support through a 24/7 online chat — well-staffed by a support team of over 800 people. In my experience, they provide very welcoming and thorough customer service. They know just how to get the most out of their platform, so if you do choose them, make sure you make good use of their expertise. While Acquia is an excellent hosting provider, they are particularly suited for developers and larger companies looking for specifically Drupal-optimized solutions. Beginners who lack the requisite programming and Drupal knowledge may not find Acquia a good fit for their needs. Wondering how Acquia stacks up against other Web Hosting companies? Enter any other Web Hosting company and we will give you a side-by-side comparison.